In 2015, according to new data on U.S. manufacturing investments, the country’s south and midwest regions gained the most manufacturing investments. California was dead last among the 50 states with 1.07 manufacturing investments for every one million people, equating to only 1.5 percent of total investments. Sadly, this is the continuation of a trend. 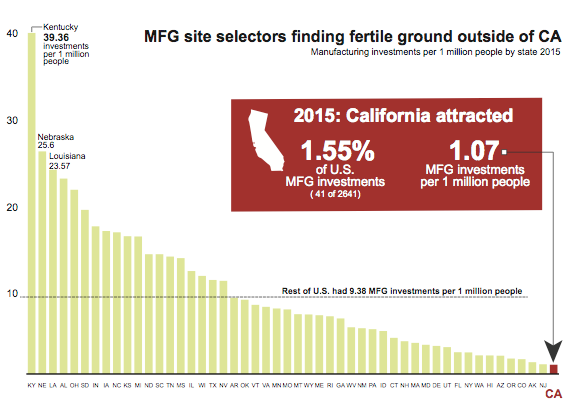 Since the recession ended in 2010, each year California has failed to attract more than two percent of the country’s new manufacturing facilities. 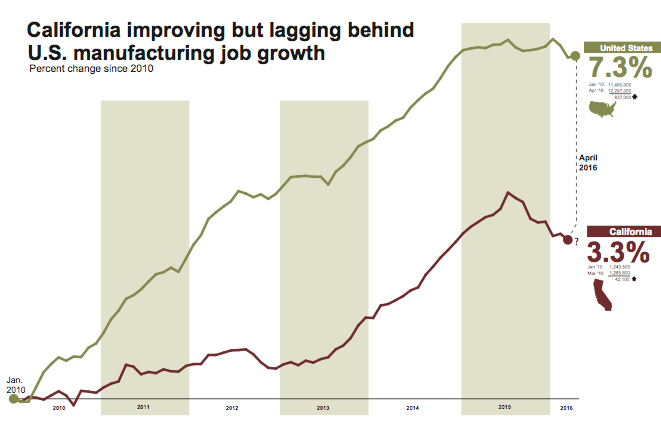 Manufacturing employment has also lagged the US, with a 3.3 percent growth in California compared to 7.3 percent nationally. If California kept pace with the national manufacturing job growth rate, we would have 50,000 more high paying manufacturing jobs today.